9781240919048 - Analytical Notes on Geology ... with an Appendix Containing the Science and Art Department Questions in Geology, 1867-74. - Bird, Charles B. a.
Analytical Notes on Geology ... with an Appendix Containing the Science and Art Department Questions in Geology, 1867-74. The GEOLOGY collection includes books from the British Library digitised by Microsoft. The works in this collection contain a number of maps, charts, and tables from the 16th to the 19th centuries documenting geological features of the natural world. Also contained are textbooks and early scientific studies that catalogue and chronicle the human stance toward water and land use. Readers will further enjoy early historical maps of rivers and shorelines demonstrating the artistry of journeymen, cartographers, and illustrators. ++++The below data was compiled from various identification fields in the bibliographic record of this title. This data is provided as an additional tool in helping to insure edition identification: ++++&lt;Source Library&gt; British Library&lt;Contributors&gt; Bird, Charles B.A. F.R.A.S. ; &lt;Original Pub Date&gt; 1875.&lt;Physical Description&gt; 31 p.; 8 .&lt;Shelfmark&gt; 7109.aaa.2. 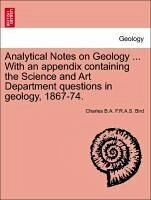 Details of the book - Analytical Notes on Geology ... with an Appendix Containing the Science and Art Department Questions in Geology, 1867-74.